It’s no good putting together orchestral programs a year or two in advance, as if they were regular symphonic concerts in the evening when two out of two (or sometimes two out of three) are matinees. What the ear may happily digest at eight or nine in the evening is not the same it wants to hear at 11 in the morning. (Nor an orchestra play.) A double bill of Liszt and his buddy Berlioz, in any case, is decidedly not suitable AM-fare. Still, it is Riccardo Muti at the helm of the Vienna Philharmonic—quality musicianship I can appreciate, even if more in theory than the mildly anemic reality of the opera or concert programs I’ve encountered with the Neapolitan maestro. 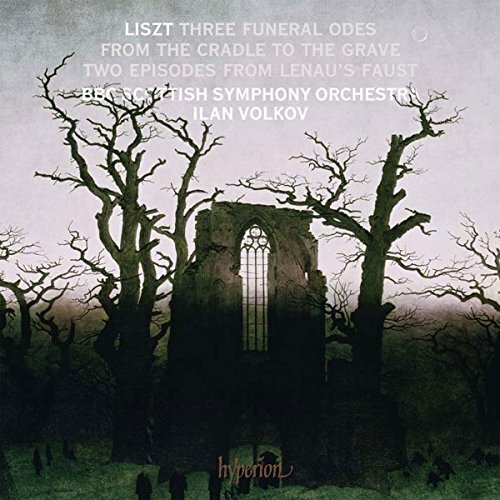 And a work by Liszt was on the bill thatI had not only never heard, but never heard of: His 13th and last symphonic poem Von der Wiege bis zum Grabe (“From the Cradle to the Grave”), composed in Rome in the early 1880s; a three-partite depiction of a drawing by Michály Zichy. The first movement, “The Cradle – Andante”, is economical with its instrumentation to the extreme—the violas and second violins set a simplistic, dark tone; the first violins add sparse, melodies that vaguely intimate an awakening. Aggressively bored coughs from the audience, unwilling to follow the long, patient musical line, interrupted that movement, much to the irritation of the twitching maestro who tried as best he could to work that elegiac episode as smoothly as possible. Then comes the nervous, tense “Struggle for Existence”, at various times aggressive and loud, with fierce trumpets and a storm of timpani salvos. After that it’s back to “The Grave, Cradle of Future Life”, which is almost an inversion of the first third… upon which the work, to this listener’s piqued befuddlement, was over. With enough Liszt under my belt, knowing what a third rate work Berlioz’ Messe solennelle is (Muti performed the work that Berlioz burnt in embarrassment in 2007 with the BRSO), and with the prospect of two more concerts on my agenda that day, I took my marching orders and retreated from the Festspielhaus. If the Kontinente (“Continents”) series still existed, it would be Kontinent Zimmermann in 2012, with a dash of Isthmus Holliger. The Festival this year offers or offered the opportunity to get better acquainted with one of the most important German post-war composers through, roughly in order of importance, Zimmermann’s opera Die Soldaten, the funereal cantata Ecclesiastic Action, the superb trumpet concerto Nobody knows de trouble I see, Das Gelb und das Grün, Un "petit rien", Metamorphose et al., the three Sonatas for solo strings, andDie fromme Helene, set to music as a “Rondo popolare”—a whimsical Entr'acte. Wilhelm Busch is little known outside German speaking countries, but there he is a household name; Walt Disney, Ambrose Bierce, and Bill Watterson rolled into one; a satirist, the first cartoonist, a humorous poet (also a very fine painter), and responsible for variously hilarious, darkly funny, illustrated stories short (like his most famous, Max & Moritz) and epic (Knopp Triology). In the tradition of German fairy tale gore, the stories end when Busch runs out of characters to kill, often with only an unsympathetic, gleefully moralizing bystander left. Firstly, it’s the thing to do. Secondly, you want it too. To find a man who isn’t sleazy. The right distraction for one’s mind. Two canaries keep her cheerful. From her hand, they peck their food. Here comes Mitzi – Helen’s cat! But, for Chirp and Twerp, too late! There they lie: lifeless in the grate. Bernd Alois Zimmermann’s music, short interludes after most of the 18 chapters, is very incidental, hardly related to the text and probably “a little number he tossed off recently in the Caribbean”, as Monty Python would say… written as a lark, on an afternoon in the park, scored for six winds, violin and viola. Pointless, you would think, for non-German speakers, but among the pitifully small audience in the University Auditorium contained more Asian visitors than kids. Musically more gratifying, indeed most gratifying—though not much less dependent on a proper grasp of German—is the 1980’s I. Keintate by Friedrich Cerha (of Lulu-completion fame). Cerha’s music has an unquantifiable Viennese-Luluesque quality to it that you know when you hear it, pulled into thin sheets like strudel-dough, with a lingering romantic, wistful undercurrent. I. Keintate is a multiple play on words, one of which translates smoothly as “Can’tata”. It’s assembled for Chansonnier and instruments (operated by the Austrian Ensemble for New Music, conducted by Johannes Kalitzke), set to short and brilliant, simplistic, disgruntled poems by Ernst Kein in all-out Viennese dialect (well enough emulated by decidedly non-Viennese Horst Maria Merz), and accompanied here with photographs of Viennese working class characters from—perhaps—roughly Vienna from the last turn of the century up to the 80s? Good fun, especially if you are into all things Vienna. As a nightcap: A Liederabend in the Mozarteum with Matthias Goerne and Christoph Eschenbach. 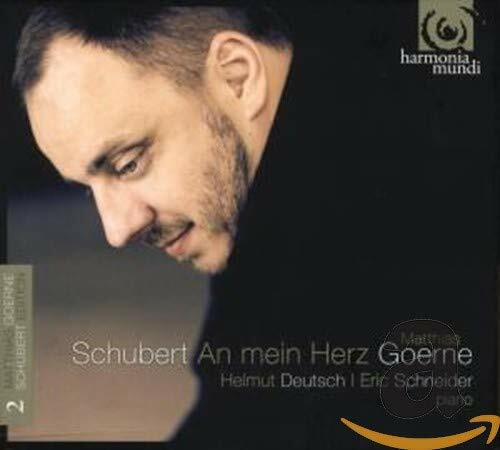 A promising proposition, not the least because Goerne’s hand-picked Schubert-cycle on Harmonia Mundi has proven such a delight; far better than I—modestly hopeful—had expected. The execution, alas, didn’t really please. No fault of that being Eschenbach’s, whose pianism, despite his conducting duties, betrays plenty of practice (unlike that of one of his colleagues who, the same night, across the river, played—though reportedly wonderful—Schubert). Eschenbach’s contribution came to the fore first in Schubert (“Three Harper Songs” D478), after the two musicians had gone through six songs by Beethoven, all mercifully and efficiently shorn of their strophic repeats. Some fault could also be found with Brahms’ Four Bloody Serious Songs, which, by using the same text from the Book of Eccelisastes as Zimmermann in his cantata (“I turned and beheld all evil under the sun”, albeit in a less archaic translation than “BAZi”), cleverly bridged to the contemporary program from two days before. But not all can be blamed on the composer, especially not the nuance-free bugling and roaring of Goerne, whose voice sounds—no matter where he sings—as though it traveled the first few yards through the vestibule of an old castello. His instrument becomes very touching when he takes it back a little, like on “O Tod, wie wohl tust du dem Dürftigen” (in the third of those four serious songs), or “Ich lehnte mich über die Brücke” (from “Wie rafft’ ich mich auf in der Nacht”, op.32/1). When he does that, it also improves his elocution to the point where you can understand the text he is singing, whereas elsewhere it’s a guessing game whether he just said “Engelszungen” or “Ochsenzunge”. Although no fault of Goerne’s, he’s not helped by Christian Gerhaher setting the bar so high in Lieder, that one is just about spoiled and ruined for different, but yes: ultimately better, more subtle approaches to art song. More of the same from Eschenbach and Goerne in the second, all-Brahms half: exceptional pianism in “Meerfahrt”, op.96/4, a little welcome relaxation on the low baritone’s part for “Sommerabend” op.85/1, and otherwise a convincing impression of a musical moose, mightily in love. Stirring occasionally, frustrating eventually.